When you’re planning a wedding, there are so many details to take into consideration – the venue, the photographer, the food and cake, the dress... and, of course the flowers. 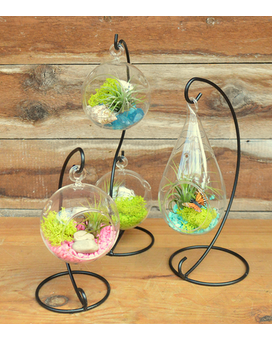 When you choose Chester’s Flower Shop and Greenhouses for your wedding floral arrangements, you can rest assured that your wedding flowers will be absolutely beautiful. We offer a wide selection of bridal bouquets, wedding ceremony flowers, floral cake decorations and centerpieces to fit any budget. 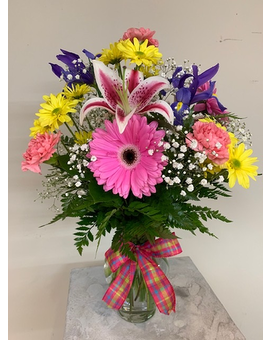 Whether your wedding is a spring, summer, fall or winter event, simple or elaborate, Chester’s Flower Shop and Greenhouses can provide bright, beautiful flowers to make the day unforgettable. 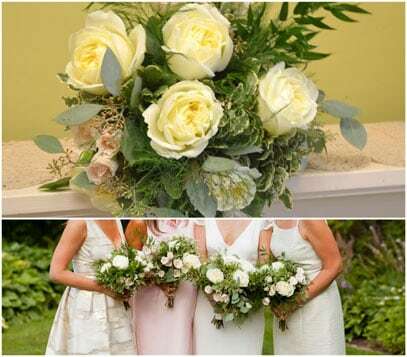 And, our floral consultants will work with you to plan your event – as experienced florists, we’re full of ideas and can provide just the right flowers for every moment of your wedding day, from gorgeous arrangements for the ceremony, to centerpieces for the reception, to flowers for the bridal bouquet and the bridal party. 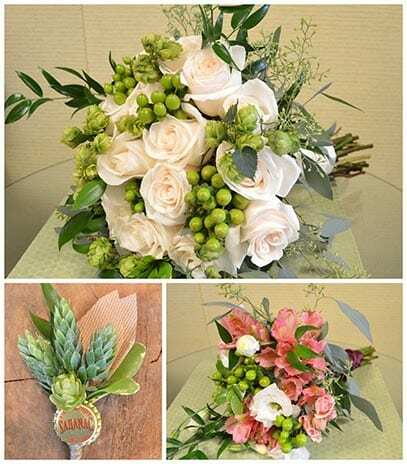 So no matter whether your dream wedding bouquet is a pastel pink and peach arrangement or a vibrant, sunny wildflower medley, Chester’s Flower Shop and Greenhouses wants to help. 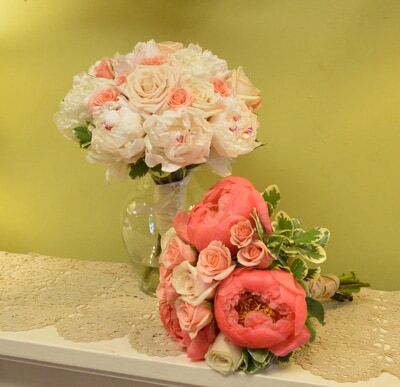 Let us surround you with beauty on your special day, with our simply lovely wedding floral arrangements. We’ll help to make your wedding day special, memorable – a dream come true! This romantic wedding took place at Our Lady of Lourdes in Utica, NY, with a reception at the Yahnundasis Golf Club in New Hartford, NY. The Bride carried a cascade bouquet filled with burgundy and light pink Dahlias, Sahara Roses, light pink spray roses, pink wax flower and seeded eucalyptus. 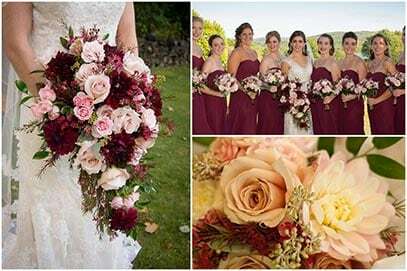 The bridesmaids carried similarly colored hand-tied bouquets with light pink dahlias, light pink spray roses, and Sahara roses, and wrapped with burgundy satin ribbon. 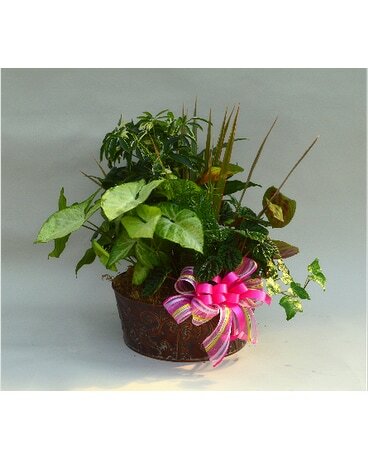 It’s always exciting for our designers when they are able to use unusual flowers or greenery in a wedding or event. For this wedding that took place at Daniele’s Banquet Hall in New Hartford, NY, we used hops as an accent flower.The bride carried a beautiful bouquet of ivory roses, hypericum berries, and fresh, fragrant hops – all framed with italian ruscus and seeded eucalyptus. 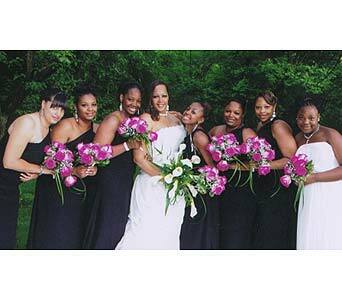 The bridesmaids carried a bouquet of white lisianthus, green hypericum berries, pink alstromeria, and pink roses, framed with seeded eucalyptus and italian ruscus. 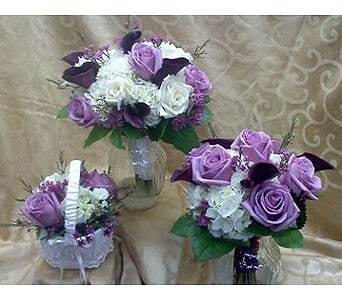 The bouquets were wrapped with plum satin. The groom and each of the groomsmen wore boutonnieres of hops and burlap leaves, completed with twine and a beer bottle cap (the ring barer’s boutonniere was a soda bottle cap). Special thanks to Jennifer Matcham Photography for allowing us to share her wedding photos with you. Bridal bouquets for this wedding located at Harding Farm in Clinton, NY included a loose assortment of beautiful white polo roses, pale pink spray roses, seeded eucalyptus, variegated pit and various greeneries. Bridal bouquet including peach gerbera daisies, cream polo roses, white freesia, peach spray roses and rhinestone accents. 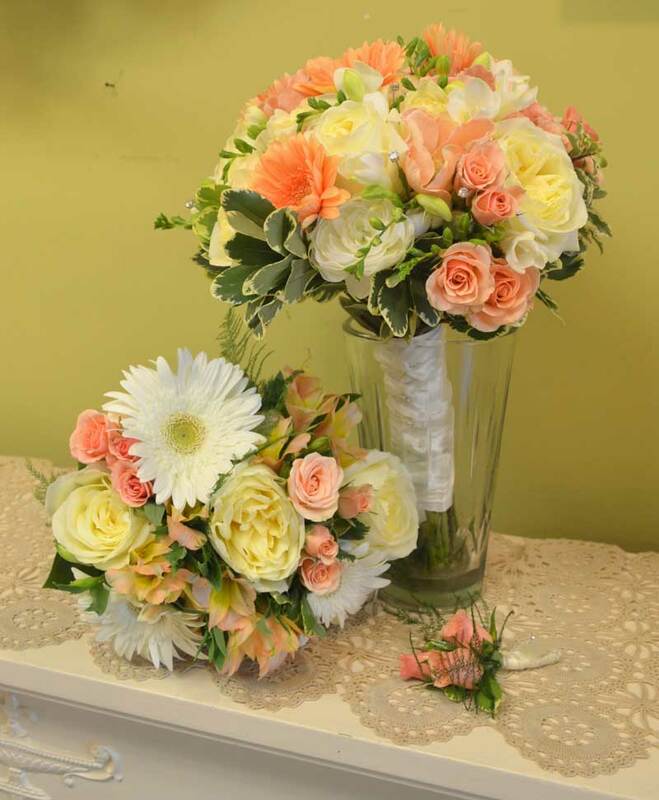 Bridesmaids bouquets include cream polo roses, white gerbera daisies, peach spray roses and peach alstromeria. Bridal bouquet with green hydrangea, peach roses, green pom mums, green hypericum berries, white alstromeria and various greenery. Wrapped in ivory satin ribbon and pearl pins. 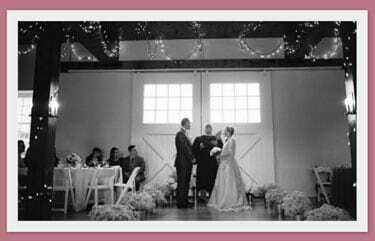 This wedding took place at Orchard Grove Farms in Frankfort, NY. The bride and grooms color choices were shades of purples and whites, and our designers chose a beautiful selection of flowers to complement their color scheme. The bridal bouquet included lavender roses, white spray roses, deep purple stock, purple lisianthus, lavender freesia, and caspia. 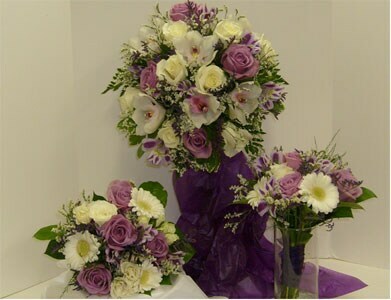 The bridesmaids bouquets included white lisianthus, light purple stock, white spray roses and caspia. This wedding took place at Fenimore Art Museum in Cooperstown, NY, had a rustic wildflower theme. Our designers chose white hydrangea, white freesia, white wax flower and lavender to create this beautiful and fragrant bridal bouquet. 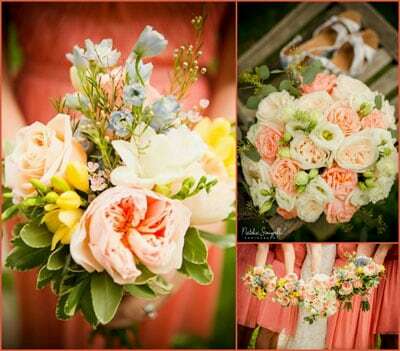 This wedding, located at Ventosa Vineyards in Geneva, NY, had a color scheme of coral, peach and white. Our designers created stunning arrangements using Free Spirit roses, peach spray roses, peach hypericum berries and white hydrangea to match. The boutonnieres were personalized by using wine corks from the vineyard. Our designers put together centerpieces and bouquets for a wedding located at a private barn in Sauquoit, NY. 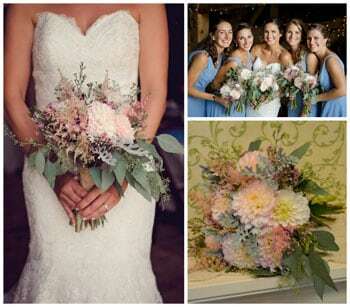 The bride’s bouquet included two shades of pink peonies, dusty miller, coral hypericum berries, astilbe, Queen Anne’s Lace and eucalyptus. This rustic wildflower wedding – located on the grounds of Harding Farms in Clinton, NY – was one of our favorites. 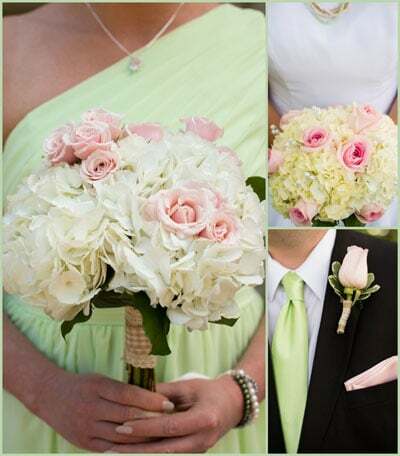 The brides bouquet consisted of peach and white garden roses, white lisianthus, and seeded eucalyptus. For the bridesmaids, our designers created beautiful bouquets of peach garden roses, blue delphinium, yellow freesia and white wax flower. 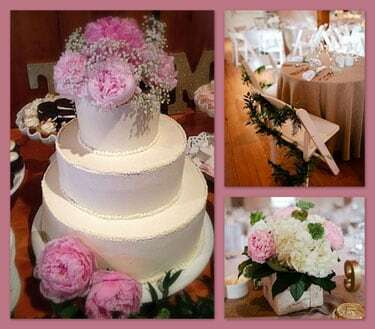 Our designers created floral pieces for a wedding at Hart’s Hill Inn in Whitesboro, NY. 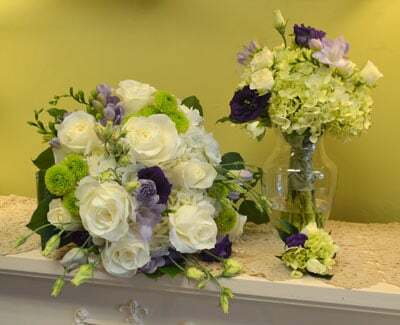 The wedding colors were shades of purple and green and our designers chose hydrangea, roses, freesia, lisianthus, and green cushion mums to create a subtle floral color pallet. For this peach themed wedding, which took place at Hamilton College Chapel and Greystone Castle, our bride and groom chose shades of peaches and corals for their flowers. 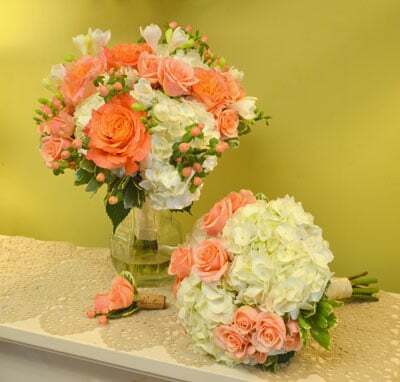 Our designers arranged coral and white peonies, sahara roses and peach spray roses to create the stunning arrangements. Bridal bouquet of blue hydrangea, white mini calla lilies and green hypericum berries. 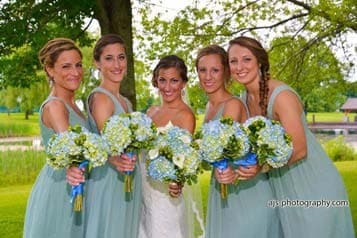 Brides maids carrying blue hydrangeas and green hypericum berries. Cake decorated with delicate pink peonies and babies breath. 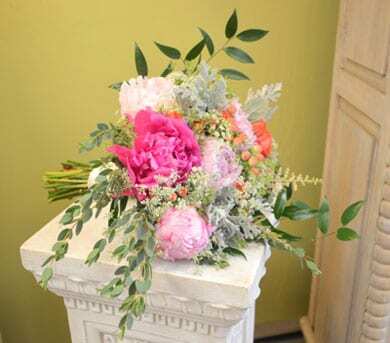 Table arrangements featuring white hydrangea and pink peonies accented with green ranunculus designed in a low rustic cube vase. Aisle Decorated simply with fluffy babies breath mounds in shiny tin buckets. 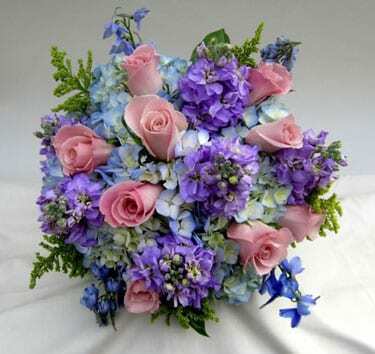 Hand Tied bridal bouquet of Blue Hydrangeas, Pink Roses, Blue Delphinium, Lavender Stock and Solidaster. 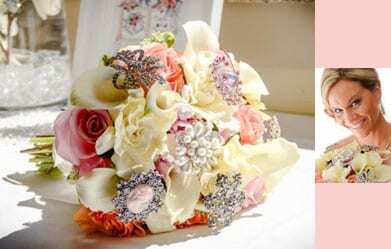 Shannon’s Bouquet – Hand tied with Mini Calla Lilies, Gardenias, Peach and Pink Roses. The bride brought in her own brooches for us to incorporate. 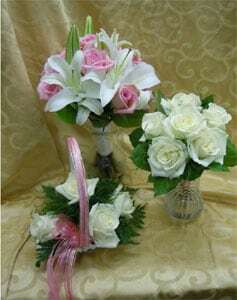 Bride is carrying White Calla lilies and the girls are carrying Ravel Pink Roses. Looks like they are having fun. 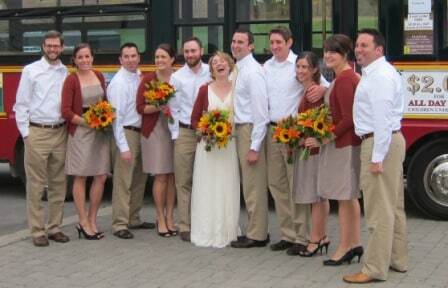 Fall wedding at “Ommegang Brewery” in Cooperstown NY Saturday October 13, 2012. 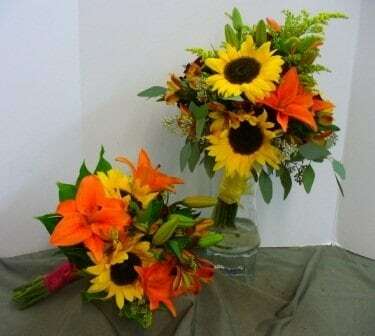 Bride and bridesmaid bouquet – Hand tied bouquet of Sunflowers, Orange Asiatic Lilies, Alstroemeria and Solidaster. 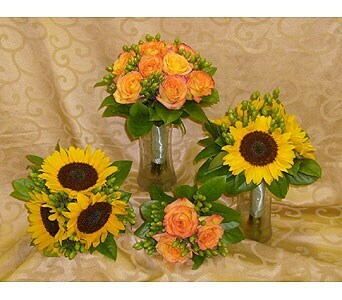 Bridesmaids Bouquet - Sunflowers, Asiatic Lilies, Spray Roses, Alstroemeria and Solidaster. 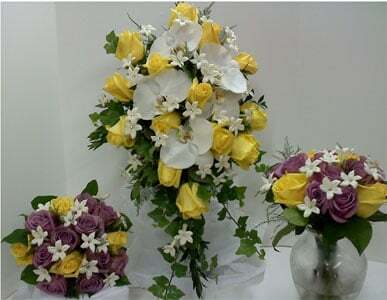 Bridal Bouquet – Cascade bouquet of White Phalaenopsis Orchids, Yellow “Mohana” Roses, White Stephanotis w/crystals in the center, and Green ivy. 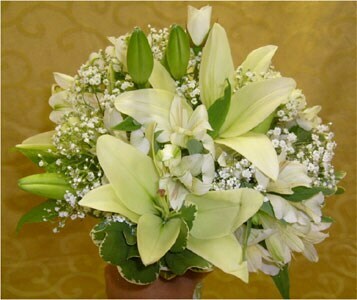 Bridal Bouquet – Hand tied bouquet Pink “Faith” Roses and White Oriental Lilies. Bridesmaid Bouquet – Hand tied bouquet of all White “Eskimo” Roses. Flower Girl Basket – All White “Eskimo” Roses w/ pink ribbon to accent. 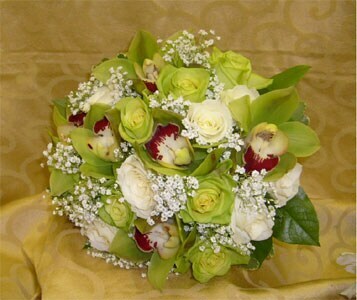 Bridal Bouquet –Hand tied bouquet of White “Eskimo” Rose, White Cabbage Rose and White Stephanotis. Bridesmaid Bouquet – Hand tied bouquet of Purple Lisianthus, Pink Carnations, Hot Pink Roses, Hot Pink Gerbera Daisy, Purple Statice. 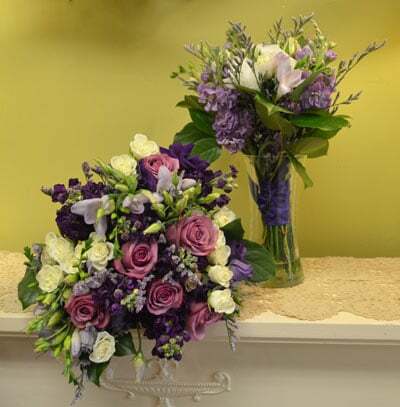 Bridal Bouquet – Cymbidium Orchids, White “Eskimo” Roses, Lavender “Cool Water” Roses, Purple/Lavender “Mayfair” Alstroemeria and White Caspia. 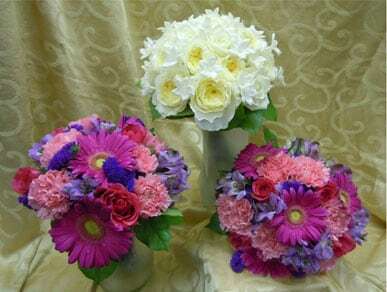 Bridesmaids Bouquet – White Gerbera Daisy, Lavender “Cool Water” Rose, Purple “ Mayfair” Alstroemeria and White Caspia. 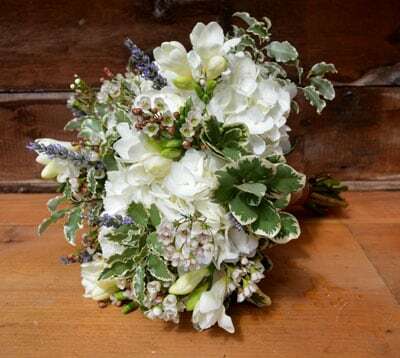 Bridesmaid Bouquet – White Lily, White Alstroemeria, Babies Breath and Variegated Pitt. Bride, Bridesmaid and Flower girl basket – Burgundy “Mini Calla Lilies”, Lavender “Cool Water” Rose, White “Eskimo” Rose, White Hydrangea and Lavender Waxflower. 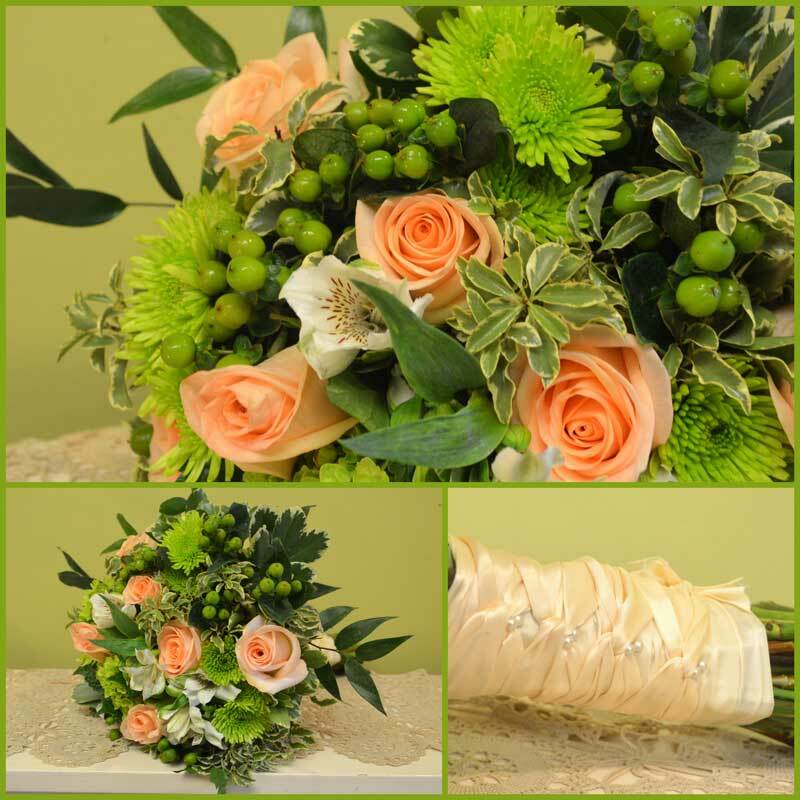 Bridal Bouquet – Yellow/Orange Rose and Green Hypericum. 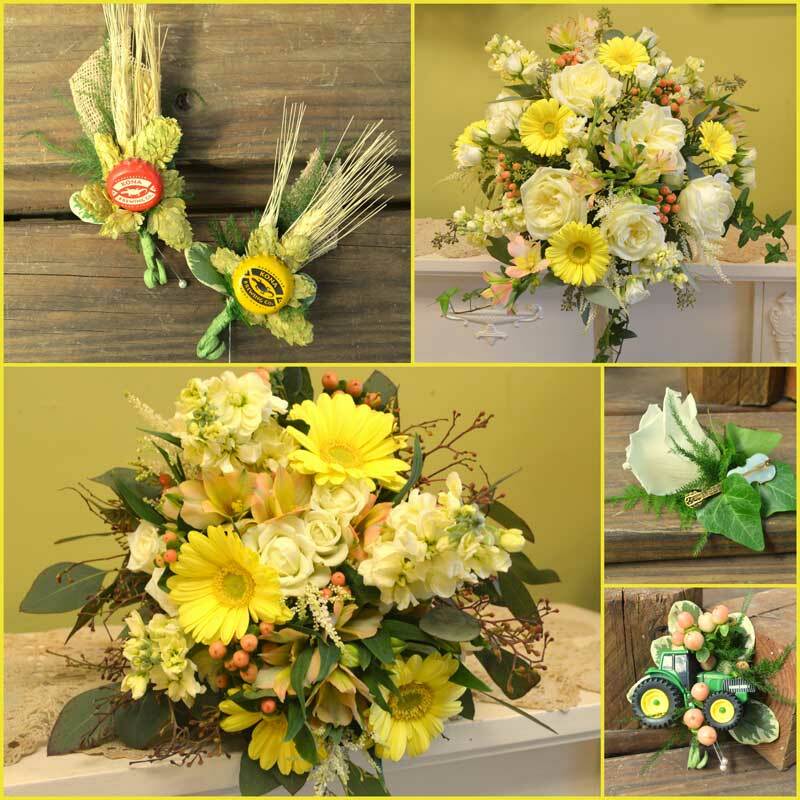 Bridesmaids Bouquet – Sunflowers and Green Hypericum.